hehehe...~ Came across this while surfing the net for MTV rabbit. 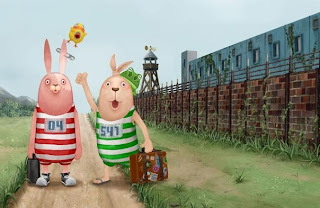 Usavich is a series of animated short films about an odd couple of rabbits being imprisoned in an russian prison. The initial story shows the absurd everyday occurances of the two rabbits' prison life, followed by their escape and life on the run in the later part of the story. Usually mind his own business. A dangerous man that stops at nothing when he is being angered.